The Greene County Memorial Hospital Foundation held its 11th Annual Golf Benefit on Friday, July 20, 2018, at the Greene County Country Club. Fifteen teams took part in the event which raised thousands of dollars the Foundation can use in fulfilling its mission of providing healthcare initiatives throughout Greene County. Event sponsor for the second consecutive year was Accelerated Construction Services. Additional major sponsors were Washington Health System Greene and Steptoe and Johnson. First place went to Behm’s Funeral home captained by Greg Rohanna. Individual skill prizes went to Laura Grandel, Jeremy Varner, Bob Dean and Sam Piccioni. On hand to add to the festivities as always were the Miss Rain Day Contestants and catering was provided by Country Kitchen Catering. Proceeds from the event will contribute to the Foundation’s ongoing effort to provide funding to various nonprofit groups throughout Greene County. 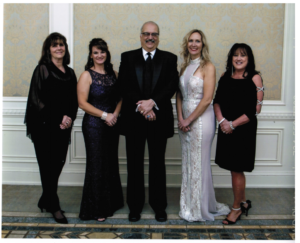 The 29th Annual Harvest Ball was held once again at the lovely Nemacolin Woodlands Resort on November 17, 2018. Musical entertainment was provided by Protégé and as always Sam Thong was on hand to add to the evening’s festivities by providing complimentary caricatures. Next year’s ball will be held on Saturday, November 9, 2019.